The summer festivals which will for sure build enthusiasm among people all over Japan are forthcoming. The number of the dance fests during the summer time in Japan is countless; Nebuta in Aomori, Gion in Kyoto, Kishiwada Danjiri in Osaka, Awa Odori in Tokushima, Yosakoi in Kochi, Eisa in Okinawa and many more Bon Odori festivals. 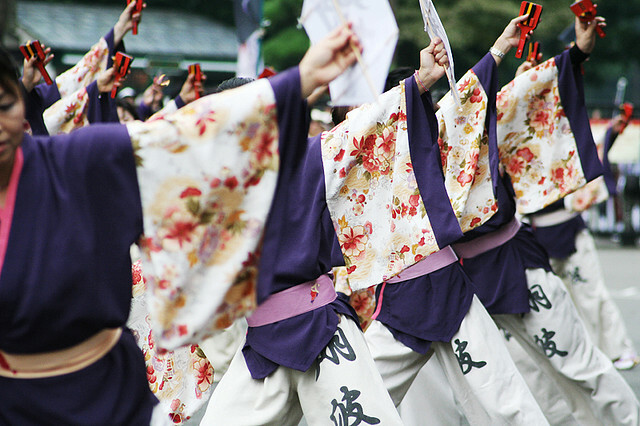 Each festival has its origin and, Awa Odori, for instance, has the history of 400 years. As the time goes by many of those festivals have gone through changes and are now enjoyed in the Tokyo area without going all the way to their home towns too. The festival will be held on 24th and 25th August this summer in the area of Harajuku, Omotesando, Meiji Shrine, Yoyogi Park and the NHK in Tokyo. Around 100 teams from all over Japan will join the parade. The can’t-miss attraction is that about 15 winning teams from the real Yosakoi in Kochi city (from 9th to 12th August 2013) will gather in the venue and show their applaudable dance in this festa. 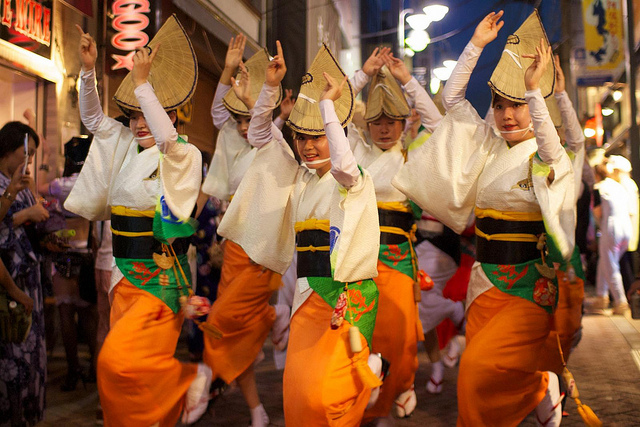 The origin of the real Awa Odori in Tokushima, Shikoku, dates back to about 400 years ago. It is held for 4 days from 12th August every year. Tokyo Koenji Awa Odori (24th and 25th August 2013 in the area of Koenji, Tokyo) started in 1957 and has had 56 times in the past. Around 10,000 people will show their stunning dance and 1000,000 audiences will gather together in Koenji during the period! Asakusa Samba Carnival, which started in 1981, has taken deep root in Asakusa and represents the Tokyo down town summer. This jubilant, colourful event attracts as many as 500,000 people in Asakusa every summer. It is scheduled for 31st August from 13:00 to 18:00 in the area of Bado Dori and Kaminarimon Dori. The parade contest will begin at 13:30. Through the parade contests modeled after the Carnival in Rio, Brazil, the festival has made a prosperous growth and become a full-scale samba carnival.